The Chinese fire belly newt (also called the oriental fire belly newt) and the Japanese fire belly newt are the most commonly found amphibians sold in pet shops. In fact, many pet stores incorrectly refer to Japanese fire belly newts as Chinese fire belly newts and vice versa. This beautiful amphibian—with brightly contrasting fiery orange-red markings on its belly—makes an active pet and requires only a small enclosure that mimics conditions found in the wild. Hardy and relatively easy to care for, fire belly newts are a popular choice for the beginner amphibian keeper. When you first bring home your fire belly newt, it may seem shy and recluse as it gets used to its new enclosure. But once it figures out its new scene, the newt will be active and spiritful, making it a good choice for a first pet. 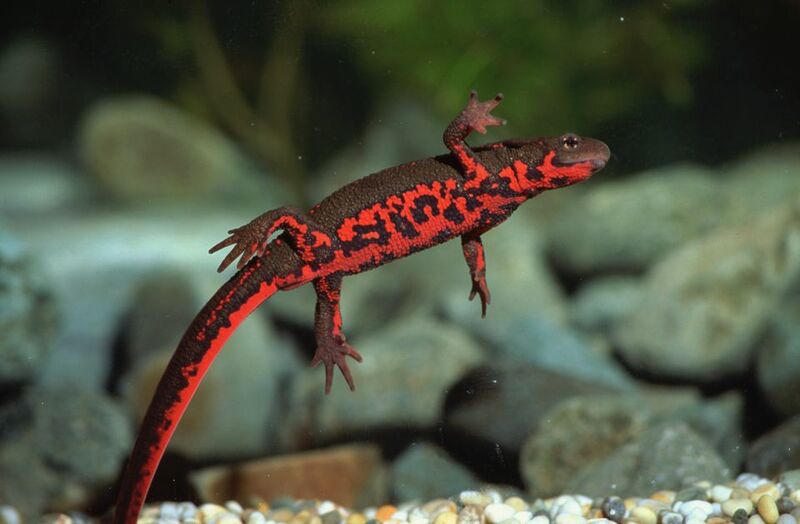 Fire belly newts (and other aqueous amphibians) spend most of their time in the water, coming to land only occasionally. And they are nocturnal, feeding and frolicking mostly at night (maybe not a good choice for a kid's room). In the wild, the fire belly newt's markings serve a warning to predators of their potent skin toxins and the poisonous glands on the sides of their head. Housing the fire belly newt requires replicating its habitat inside of an aquarium. In the wild, fire belly newts are aquatic, so an ample water source is necessary. But newts also need a dry land area so they can climb out to rest and bask in the artificial sun. (Note: The occasional fire belly newt will actually spend more of its time on land.) And while they don't need a huge enclosure, the larger the volume of water newts live in, the less chance of toxic waste build-up. A 20-gallon tank can house up to four fire belly newts. The aquarium's landform can consist of a sloping gravel substrate, replicating the shore of a natural water source. You can recreate this with Plexiglas set in place with aquarium-grade silicone. Rocks, moss, and pieces of bark make great hiding places, and a floating island of wood or rocks (which should be smooth to prevent damaging the newt's delicate skin) can be provided as a supplemental land source. Contrary to popular belief, fire belly newts thrive in cool temperatures. And while they tolerate room temperature, they are happiest between 60 to 75 degrees Fahrenheit. At temperatures above 75 degrees Fahrenheit, fire belly newts become stressed and susceptible to infection, particularly of the fungal variety. Unless you have air conditioning or live in an exceptionally cool climate, keeping your newt's tank in the basement helps maintain lower temperatures. In hot weather, positioning a fan over the aquarium or providing a source of melting, de-chlorinated ice may help your newt cool off if the ambient room temperature runs high. Newts should be kept on a regular cycle of 12 hours of light and 12 hours of dark. During the summer, a well-lit room with ample daylight should suffice (as long as the tank isn't in direct sunlight.) In the winter, you may need an artificial light on a timer to replicate these conditions. Newts do not have special UV requirements, but a low-watt fluorescent fixture may be used to propagate live plants. Just make sure the newts have a shaded area or a shelter that they can retreat to. To mimic the floor of an environmental water source in the wild, line the bottom of the tank with smooth gravel. Make sure the gravel you choose is large enough so the newt cannot ingest it. And provide lots of live plants (although plastic is easier to care for) to maintain homeostasis in the aquarium and keep the water source clean and healthy. You may have to try a few food sources before finding one that works for your newt, however, bloodworms (frozen or live) seem to be a favorite and are readily available at most pet stores. Fire belly newts also eat earthworms (chopped up), brine shrimp, glass shrimp, daphnia, and freeze-dried Tubifex cubes. You can also try floating amphibian sticks, but many newts refuse to eat them. Large newts—particularly larger Japanese newts—may also dine on guppies, if offered. It may also take a little experimentation to figure out how much and often your newt should be fed. Typically, every other day or every three days is sufficient. Examine your newt's growing pattern and body condition to assess if you are feeding it too much (Does it look chubby?) or too little (Is it too skinny?). Any excess food left in the tank is a tell-tale sign you're feeding your newt too often and decaying food will contribute toxic build-up in the tank. Cut back its diet if this is the case. Since newts thrive in a fully-aquatic setup, filling your aquarium with well or de-chlorinated water works great. Chlorinated water must be treated with tablets before filling the tank. This precaution should also be adhered to when cleaning and replacing water. Filtration is crucial to tank health (although strong currents are best avoided). Air-powered corner filters work best and create very little current. Internal power filters, positioned on their minimal setting, and under-gravel filters can also be used. Approximately 1/3 of the tank's water should be removed and replaced with fresh water every one to two weeks, depending on the size of the tank and the number of newts it houses. And a gravel washer (available at pet stores) also makes cleaning easy, as it gently agitates the tank's bottom as the water is siphoned off. Most health problems in captive newts arise from unclean water. Bacteria and fungus can build up in the tank, causing skin lesions and infections. If you notice a lesion on your newt, contact your vet and clean its water promptly. If you catch the problem quick enough, it should be easy to remedy. However, prolonged, unsuitable tank conditions can cause death. You must also take caution in handling your newts and making sure they are out of reach of other pets. Since fire belly newts produce toxins through their skin and glands, gloves must be worn to avoid skin irritation or ingestion. Pets, like dogs or cats, that eat a newt should be rushed to the vet, as they can die. Due to a lethal fungus called chytrid fungus that exists among wild populations of many tailed amphibians, newts and salamanders cannot be imported into the U.S. However, there are a few domestic breeders selling newts to in-state residents. To purchase a newt outside of your state, look online for a reputable dealer or contact your local pet store for more information. If you're having trouble locating a fire belly newt, the Eastern newt (a domestic variety found up and down the East Coast and as far west as Texas) makes another colorful beginner pet. Otherwise, check out all of our other Gecko breed profiles. How Many Fire-Bellied Newts Can You Keep Per Tank or Gallon?